What is the Difference Between Cheddar and Colby Cheese? Cheese I love you. Oh how much I do. There was a national cheese lover’s day back in January but for me everyday is cheese lover’s day. So of course I gotta to talk about cheese on the blog. Today I wanted talk about two different types of cheese that you can find in any store, whether big or small, old or new – Cheddar and Colby. Both of these are extremely popular. Have you ever stopped to think much about the two. What is the difference between a block of Cheddar and a block of Colby. Can I use them interchangeably? Get ready for a lesson in love – love for cheese. Let’s first take a look at what each cheese is. How is made? 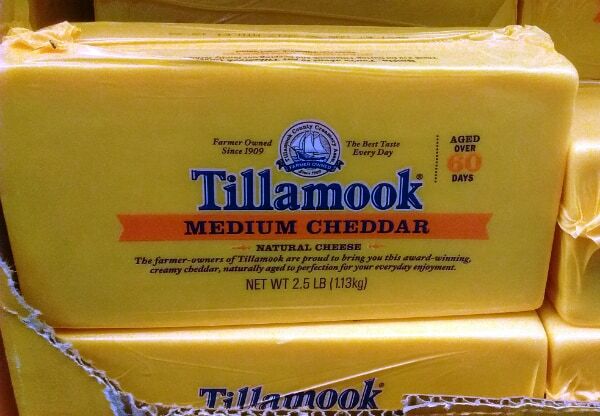 Tillamook is making some wonderful cheddar out in Oregon. Did you know there is a Cheddar, England? Yes this cheese is named after an actual place, where it originated from. Cheddar making begins by adding a starter bacteria. That adds acidity to the milk. Rennet is added to separate the curds from the whey. The curds are then gently heated, which will release even more whey. This is process is done for many types of cheeses. With Cheddar, it then undergoes a process called cheddaring in which the curds are flipped & pressed over and over again to release more whey. Then the curds are cut into small pieces and then pressed into molds. The cheese is aged for how ever long the cheesemaker wants to. We did a Colby cheese tasting with the kids. They had fun trying the different cheese. Each kid seem to have a different favorite. These were all Colby cheeses that I picked up at Jungle Jim’s International Market just outside of Cincinnati, Ohio. Did you know there is a Colby, Wisconsin? They don’t make Colby there. I know how disappointing. The cheese did originate there but since production has moved elsewhere. This is a call to the people of Colby – bring it back!!! The difference in Colby making is that you wash the curds with water. This reduces the acid in the cheese, creating a milder product. The cheese also doesn’t undergo the cheddaring process that removes more whey. Colby is only aged for a short period. Cheddar on the left, and Colby on the right. 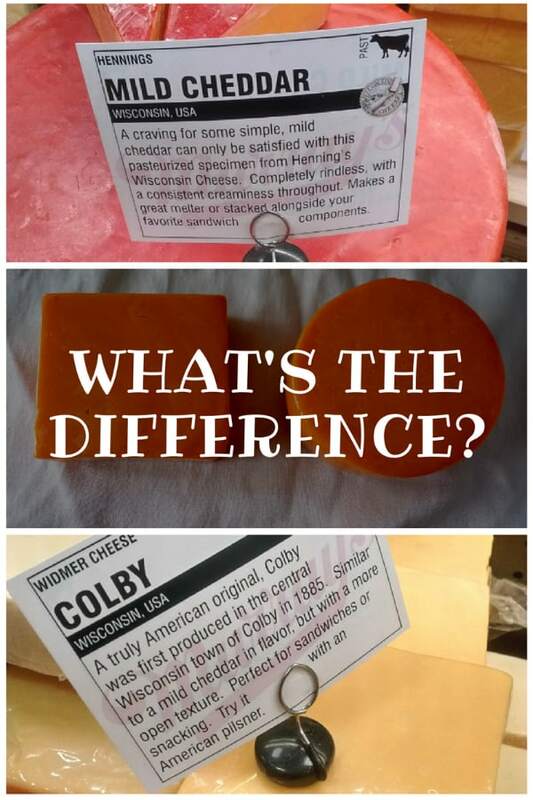 What is the Difference Between Colby and Cheddar? We see that there are differences in how Colby and Cheddar are made. How does that affect the cheese itself? You might think they really don’t taste different. Sometimes that is actually true. A lot of the cheap Colby you find in the store is almost indistinguishable from mild cheddar – I kind of question whether it is made the same exact way, with just the name Colby slapped on. Legit Colby does taste different than Cheddar. 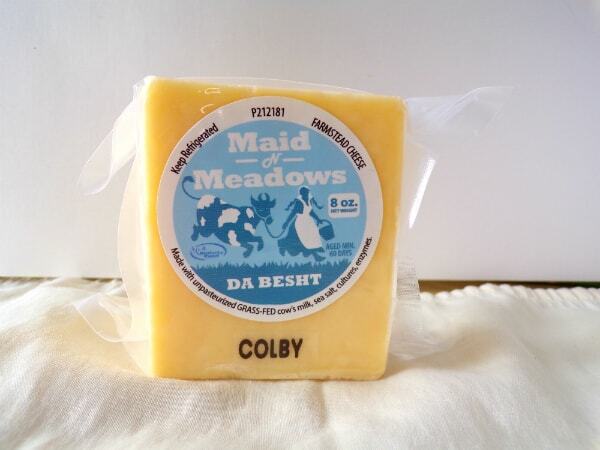 Since Colby is washed with water, the acid is reduced, creating a cheese that is a bit sweeter and less tangy in flavor. Colby is rarely aged very long so it doesn’t develop the bite that a sharp cheddar would. The range in flavor of Cheddar is a lot bigger than that for Colby. If you look closely at this cheese you will see that there are some small holes through the cheese. 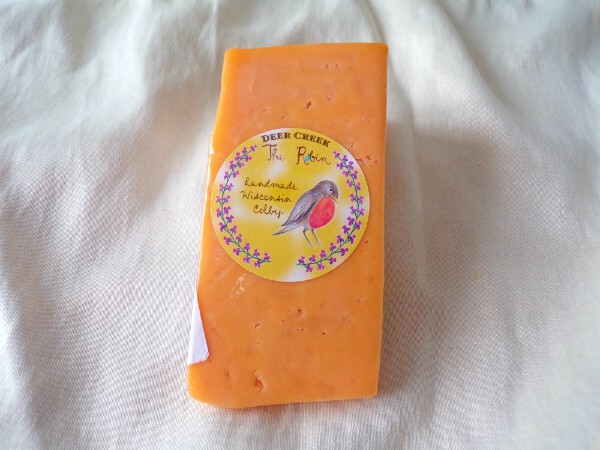 This Colby from Deer Creek cheese is the newest Colby I have tried and it’s one of the best. The biggest difference you will notice is the moisture content of the cheese. Colby is more moist than Cheddar, especially aged Cheddar. Since it does not undergo the cheddaring process, there is more whey that the cheese retains. If I am just eating the cheese on top of a cracker I can appreciate that added moisture. The cheese taste creamier on the tongue. Now I don’t want you to leave this post thinking there are no aged Colby cheese out there. There are. I had a block before. It was really dry – like the desert. You could easily crump it like Feta or Quesco Fresco, but not nearly as moist as either of those cheeses. Trying to make a slice of it with a knife was futile. I had to drink a glass of water to be able to get the cheese down without choking. My thought: Colby really doesn’t do well as an aged cheese and should best be enjoyed young. Real Colby connoisseurs might say the younger the better. This Colby has a more bold flavor than other Colbys I have tried. It was made from raw, grass-fed milk which really gives an unexpected zing to the cheese. 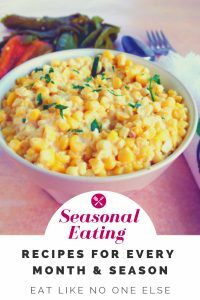 This one would be good mac & cheese fodder. You will also notice that is not orange. No coloring was added to this cheese which is not the standard for Colby cheese. Here in America we like our cheese to be orange. Much of the world thinks we are nuts that we color our cheese. Nearly all Colby gets the Annatto seed treatment that dies the cheese orange without adding any flavor. Most Cheddar does as well, but white Cheddar is not hard to come by. This might very well be the question that brought you to this post (your thinking, thank goodness he is finally getting to my question). When it comes to melting how do Cheddar and Colby match up? Both are good melting cheeses, especially Colby. 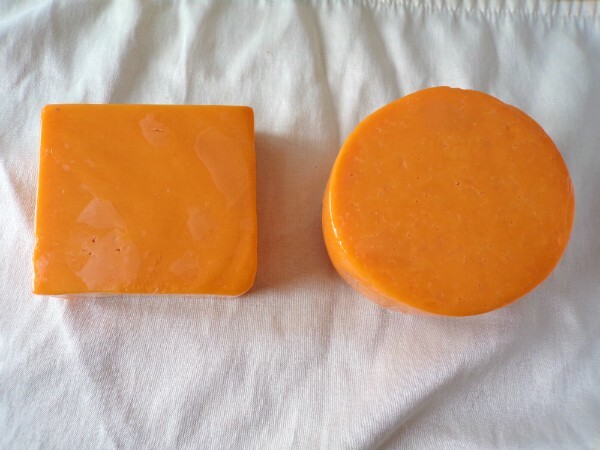 If you get a really aged Cheddar, like a 5 year, it behaves more like Parmesan than the milder Cheddar. We did a little test at our household last week. We fried up a batch of homemade tortilla chips and then melted some cheese on them. I divided a half sheet pan with melted Colby on one side and melted mild Cheddar on the other. The kids end up picking the Colby as their favorite. When it comes to making mac & cheese or any cheese sauce, I wouldn’t use Colby. You really need a cheese with a bigger bite since when you add butter and/or milk it “waters down” the flavor of the cheese. Maybe shredded some Colby right on top for service wouldn’t be a bad idea – adds some nice creaminess. My oldest really like shredded Co-Jack right on top of her mac & cheese. She learned that from the mac & cheese at the Noodles & Company restaurant chain. 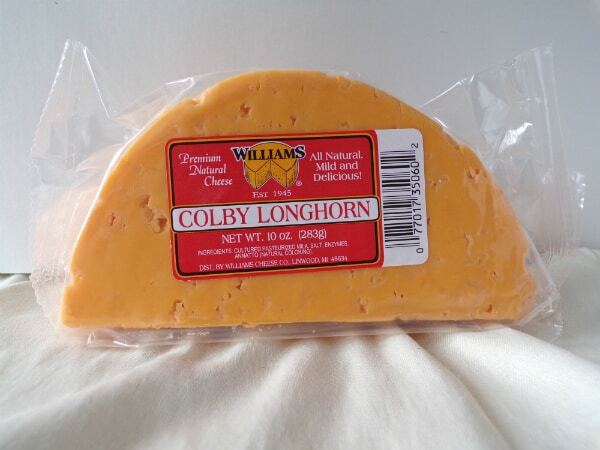 Colby is often sold as Longhorn Colby. The cheese is a half moon shape. Also notice the open texture in this cheese. Good Colby should always look like this. Both of these cheese come in the standard rectangle or square blocks. There are many times you will find Colby in a cylinder or made Longhorn style, which looks like a half moon when cut. The serious Colby fans believe it’s not Colby if it’s not Longhorn Colby. A classic kid’s favorite – Colby Jack or Co-Jack. 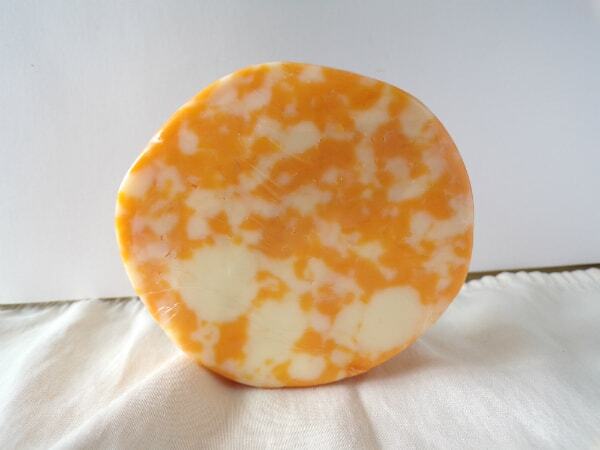 This one was made by one of my favorite cheesemakers – Guggisberg. 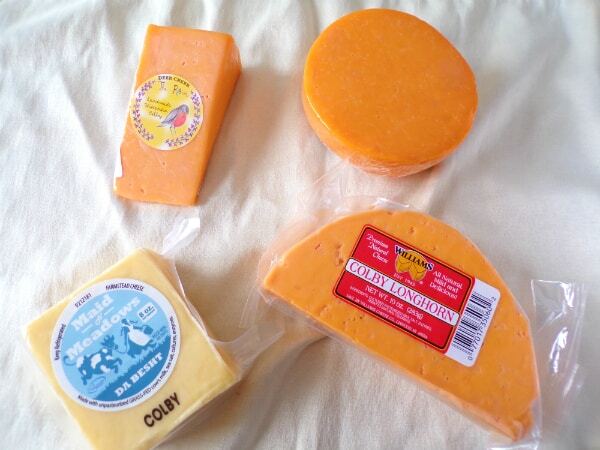 Both Cheddar and Colby are paired with Monterrey Jack cheese. This is an eye appealing combination. More often it is Colby than is paired with Jack to created Colby Jack or Co-Jack cheese. It’s one of our kids’ favorites. Virtually every big cheese producer, like Sargento, sells a bag of shredded Co-Jack cheese. Are you a Colby or Cheddar fan? Or like me, an equal opportunist when it comes to my love for these two similar, yet different cheeses. Next time you visit Wisconsin check out Humbird Cheese in Tomah WI. Best cheese ever at that store. If you want a good Gouda, try Marieckes, Pronunced Mary eckie. Millers cheese house in Rice lake has his and it is to die for. 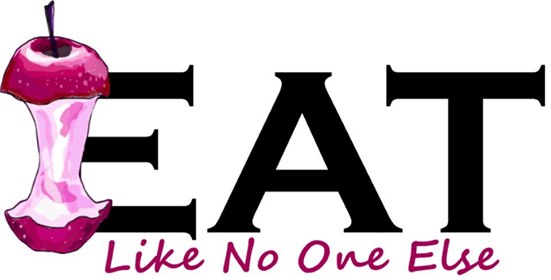 It won’t come cheap but worth every wonderful bite. 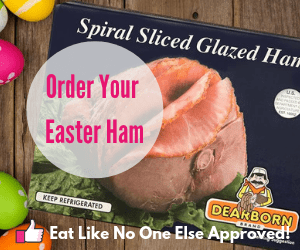 Happy cheese eaing, Cindy Berka, Hayward Wisconsin. The Gouda cheese is worth looking up on the internet and read the story about how it came to be. Can’t remember what town they are located in but if you come to Wisconsin it is worth looking up. They raise their own cows, and use the milk to make the cheese. You can watch them milk, even make the cheese , I think. Best to look them up. Your kids would love going there. It is a very nice place and kid friendly.